When it comes to designing homes, the best advice you get from your friends would be, “kisi ka design copy ker le yar, itni mushkil mein kyun perta hai”. Meaning, imitate an existing home design and save yourself from all the hassle. But, what if you really want to have a wonderfully designed front gate? Well, the response wouldn’t be much different. The reason being is people in Pakistan believe hiring a professional architecture company in Pakistan can significantly increase their cost. Whereas copying an existing design can save cash and time. Unfortunately, that’s not the case. In reality, replicating an original design never yield the results that you long for because private contractors lack the skills, experience and knowledge to deliver the desired result. Consequently, you have to live with that poorly designed front gate and bear monetary loss as well. So be smart and make wise decisions by learning from the mistakes of others. 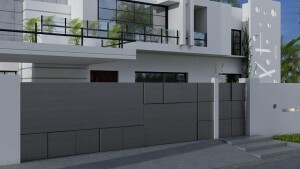 By acquiring the services of professional construction or interior design company in Pakistan, you’ll not only get access to plethora of designs, but your firm may also build a custom front gate (just as AmerAdnan Associates do) for you that will meet your budget and time line. 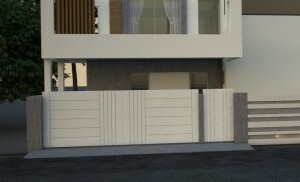 A modern design where the grooves on the gate compliments the horizontal lines and boundary walls. The color scheme of the gate is also in-line with the house. The wooden planks are pasted on the steel gate with tongue and grove joint in the middle. The unique design is flawlessly complimenting the elevation of the house. This smoothly finished metal gate has square projections that are perfectly blending with theme of the house.